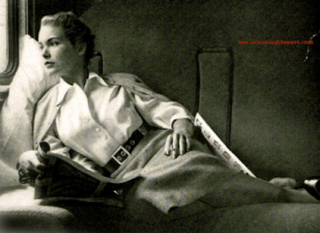 Star of Alfred Hitchcock’s PSYCHO, Janet Leigh is ready to board the famous SUPER CHIEF and Virginia Leith, star of A KISS BEFORE DYING shows us the all-Pullman train during the 1950s in a promotional film. 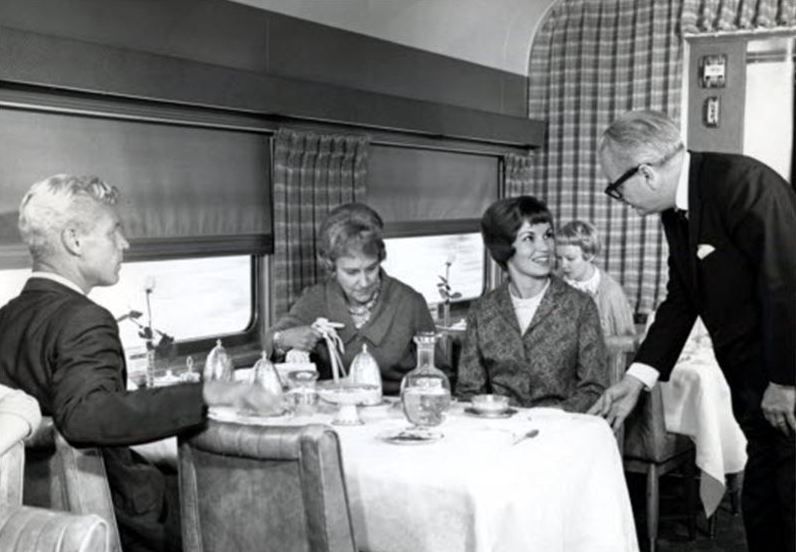 Even the characters from TV’s MAD MEN may have been aboard the train all through the 1960s. A lot of executives would take the train for a weekend with a secretary. The train was one of the last luxury streamliners lasting until Amtrak took over the nation’s passenger train system. Super Chief leaving Chicago for Los Angeles. 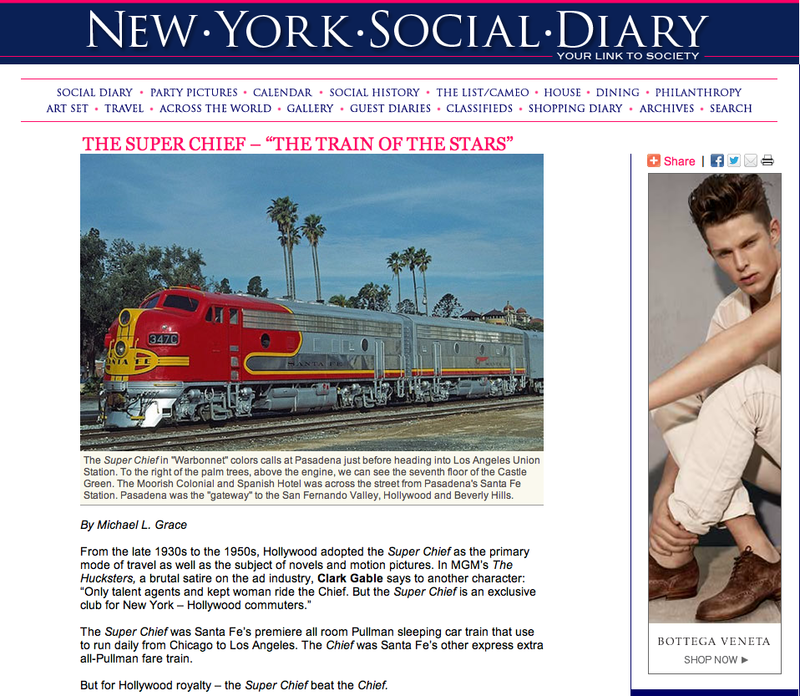 In the 1960s, I traveled aboard the SUPER CHIEF four different times. The train was truly First Class and a far cry from traveling aboard Amtrak. There were no coaches, people dressed, elegant dining, great Pullman service, and a truly elegant feel. Santa Fe was great at promotion, as proved by the Janet Leigh fashion layout and Virginia Leigh starring in a film all about the SUPER CHIEF. 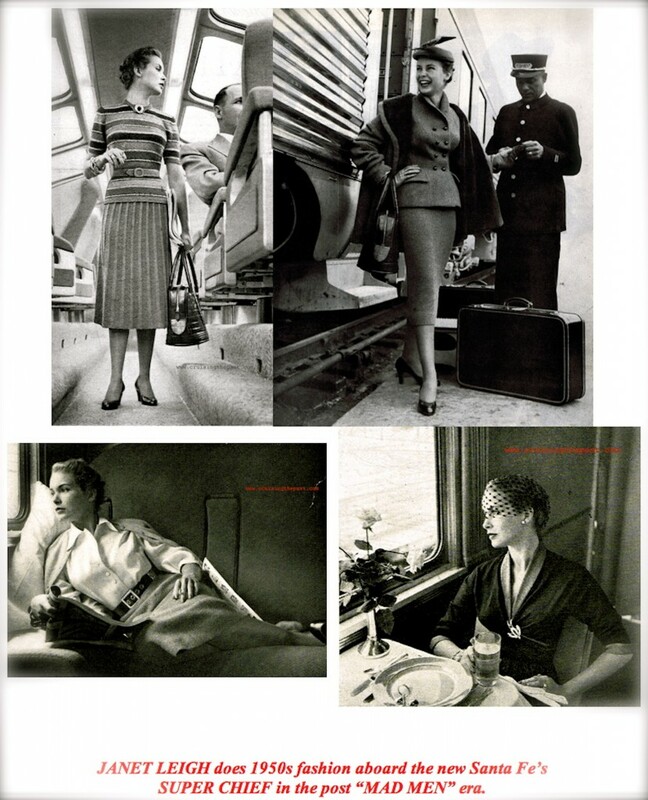 Janet Leigh did a major fashion layout aboard the new Super Chief in the 1950s. Virginia Leith purchasing a ticket on the SUPER CHIEF. Virginia Leith, 20th Century Fox star of “A Kiss Before Dying”, did this fun film on the Super Chief – very retro and very 1950s. All the stars “sailed” abroad the Santa Fe’s All-Pullman deluxe Super Chief between Los Angeles and Chicago. Regular passenger lists would include Janet Leigh, Jimmy Durante, Rosalind Rusell, Zero Mostel, Bing Crosby, Margaret Truman, Gloria Swanson, Alan Ladd, Kirk Douglas, Clark Gabel, Billy Wilder, Joan Crawford and on and on. 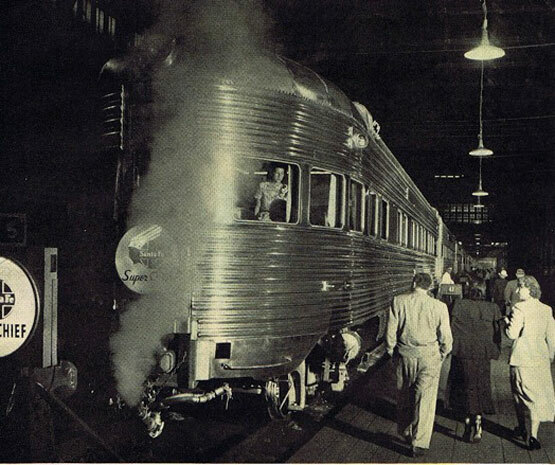 (Left: Passengers in the Pleasure Dome Car) The Super Chief was one of the named passenger trains and the flagship of the Atchison, Topeka and Santa Fe Railway. It was often referred to as “The Train of the Stars” because of the many celebrities who traveled on the streamliner between Chicago, Illinois and Los Angeles, California. The Super Chief (assigned train Nos. 17 & 18) was the first Diesel-powered, all-Pullman sleeping car train in America, and it eclipsed the Chief as Santa Fe’s standard bearer. The extra-fare Super Chief-1 commenced its maiden run from Dearborn Station in Chicago on May 12, 1936. Just over a year later, in May 1937 the much-improved Super Chief-2 traversed the 2,227.3 miles (3,584.5 kilometers) from Los Angeles over recently upgraded tracks in 36 hours and 49 minutes, averaging 60 miles/hour overall, and often reaching 100 miles/hour. 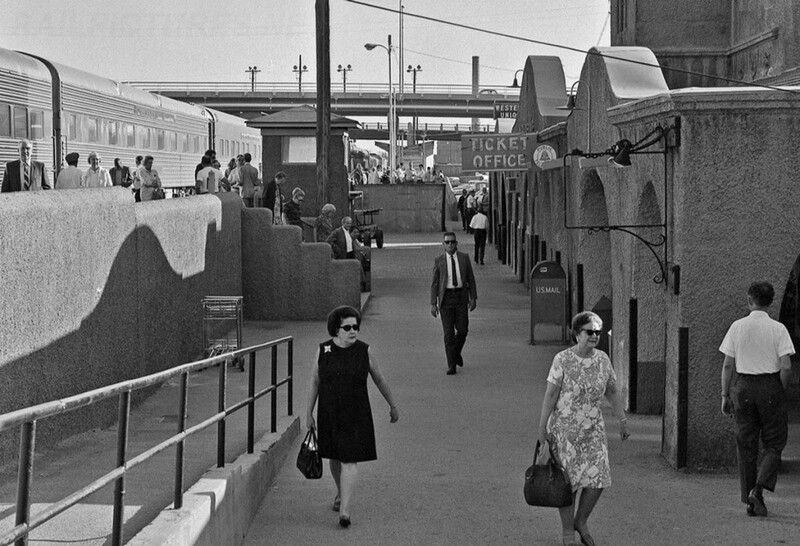 The SUPER CHIEF stops at Albuquerque, New Mexico in the 1960s – halfway between the Los Angeles and Chicago. Right in the middle of the “Mad Men” era. Passengers dressed – it was first class. 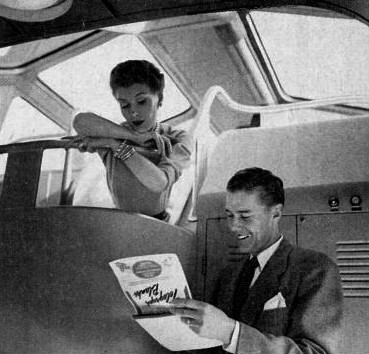 From that day forward the Super Chief set a new standard for luxury rail travel in America. With only one set of equipment, the train initially operated but once a week from both Chicago and Los Angeles. However, at the height of its popularity, and with added equipment, the trains of the Super Chief made daily departures from both ends of the line. Adding to the train’s mystique were its gourmet meals and Hollywood clientele. 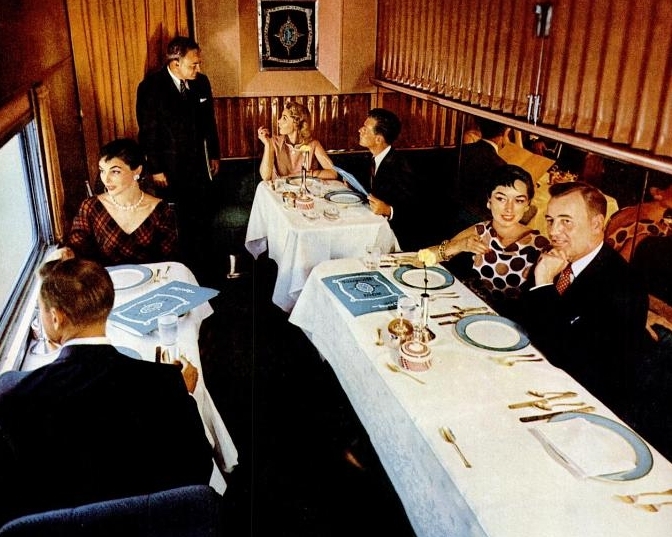 The SUPER CHIEF dining car in the 1960s. Very much TV’s MAD MEN. Luxury like this will never be seen aboard a train again. The SUPER CHIEF dining car was first class – including finger bowls. The excellent cuisine was prepared aboard – from prime steaks to fresh trout to caviar. Tables covered in starched linen, highly polished silver specially designed china and glassware. The steward supervised the onboard restaurant and attentive waiters provided top service. There were no microwaves or people in tank-tops. Direct competitors to the Super Chief during its lifetime were the City of Los Angeles, a streamlined passenger train jointly operated by the Chicago and North Western Railway and the Union Pacific Railroad. And (to a lesser extent) the Golden State, a streamlined passenger train jointly operated by the Rock Island and Southern Pacific railroads. The Santa Fe Super Chief was one of the last passenger trains in the United States to carry an all-Pullman consist; only the Pennsylvania Railroad’s Broadway Limited and the Illinois Central’s Panama Limited survived longer. The train maintained its legendary high level of service until the end of Santa Fe passenger operations on May 1, 1971. Next: JUDY GARLAND aboard the SS UNITED STATES sailing from New York to Europe.